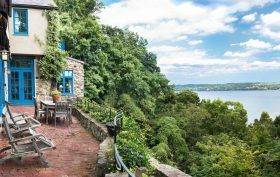 This 1920s stone house couldn’t come with a much better location: built into the cliffs of the Palisades, with sweeping views of the Hudson River. This two-acre property is located at 61 Woods Road in the upstate town of Orangetown, and has just hit the market for $4.6 million. The home boasts long stone terraces that face the water, stone steps that lead to the lower-level lawn, built into the rock face, and a charming guest cottage. The stunning property was also once home to Diane Sawyer and the late Mike Nichols.